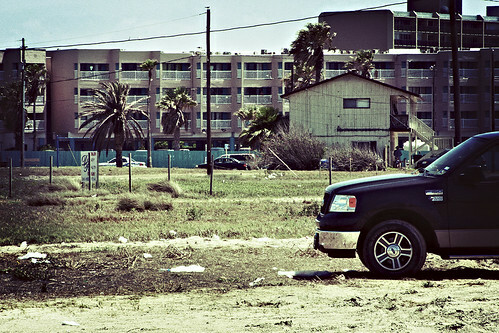 Taken on July 7th 2009 in Corpus Christi Texas. This is my first attempt to recreate the Lomo look (Cross-Processing) in Photoshop. Recently I was hired to be the photographer for a corporate event. After taking more than 100 pictures of the people and these girls, the girls asked me if they could take a picture with me (well maybe it was the other way around). Testing out my new logo. I'm fond of everything Japanese, the initials resemble Japanese writing. Anyway, I enjoyed working on this picture, and I'm learning a lot. I'm still a novice when it comes to photography, but I think I'm in the right path. Constructive criticism is always welcomed. 1 4ls0 h4v3 b33n l34rn1ng th3 l33t l4ngu4g3. I came accross this link from wikiHow. It's very interesting. Here's a photo from 4 or 5 weeks ago. Shot in color, then converted to Black and White, then some other stuff was added. I'm quite proud of the way this photo came out. Should I hit the self destruct button now or later? Mmm, I'll give it another week or so.